The electronic throttle control system is composed of the throttle actuator, throttle position sensor, accelerator pedal position sensor, and ECM. The ECM operates the throttle actuator to regulate the throttle valve in response to driver inputs. The throttle position sensor detects the opening angle of the throttle valve, and provides the ECM with feedback so that the throttle valve can be appropriately controlled by the ECM. The throttle valve opening angle continues to vary greatly from the target opening angle (1 trip detection logic). The ECM determines the actual opening angle of the throttle valve from the throttle position sensor signal. The actual opening angle is compared to the target opening angle commanded by the ECM. 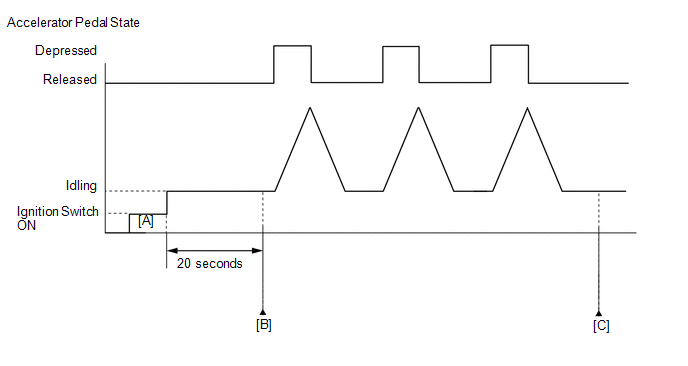 If the difference between these two values is outside the standard range, the ECM interprets this as a malfunction in the electronic throttle control system. The ECM then illuminates the MIL and stores the DTC. Clear the DTCs (even if no DTCs are stored, perform the clear DTC operation) (See page ). Idle the engine for 20 seconds. If the judgment result shows INCOMPLETE or N/A, fully depress and release the accelerator pedal 3 times, and then check the DTC judgment result at step [C]. When this DTC, as well as other DTCs relating to Electronic Throttle Control System (ETCS) malfunctions, is stored, the ECM enters fail-safe mode. During fail-safe mode, the ECM cuts the current to the throttle actuator, and the throttle valve is returned to a 6° throttle angle by the return spring. The ECM then adjusts the engine output by controlling the fuel injection (intermittent fuel-cut) and ignition timing, in accordance with the accelerator pedal opening angle, to allow the vehicle to continue running at a minimal speed. If the accelerator pedal is depressed firmly and gently, the vehicle can be driven slowly. Refer to DTC P2102 (See page ). Refer to "Data List / Active Test" [Throttle Position Command, Throttle Position No. 1, Throttle Motor Current, Throttle Motor Duty (Open), Throttle Motor Duty (Close)] (See page ). If any DTCs other than P2119 are output, troubleshoot those DTCs first. (g) Enter the following menus: Powertrain / Engine / Data List / Throttle Position No. 1 and Throttle Position Command. (h) Check the values displayed on the Techstream while fully depressing and releasing the accelerator pedal quickly. When a DTC is output, the system changes to fail-safe mode. Therefore, only use the data up until the time the DTC is stored for confirmation. (a) Inspect the throttle body assembly (See page ). (a) Check for contamination between the throttle valve and housing. If necessary, clean the throttle body. Also, check that the throttle valve moves smoothly. Throttle valve is not contaminated with foreign objects and moves smoothly. (g) Enter the following menus: Powertrain / Engine / Data List / Throttle Position No. 1, Throttle Position No. 2 and Throttle Position Command. (h) Check the values displayed on the Techstream while wiggling the ECM wire harness. (a) As the DTC was stored due to a change in the contact resistance of the connector, repair or replace the wire harness or connector (See page ). (a) Replace the throttle body assembly (See page ). (f) Allow the engine to idle for 15 seconds or more. (g) Fully depress and release the accelerator pedal several times quickly.